Pervez Musharraf, the President of Pakistan, will step down as army chief if he wins the presidential election again, government officials said Tuesday. The announcement made in the Supreme Court was the first clear official statement that Pakistan's military leader plans to contest the upcoming election while in uniform, then relinquish it afterward. Musharraf, who took power in a 1999 coup and has seen his popularity slide in recent months after a failed attempt to sack Pakistan's top judge, currently holds the office of both president and army chief. Critics also cite a resurgence of Taliban and al-Qaida militants along the Afghan border as reasons why he should stand down from the army post, the main source of his power. His current presidential term expires Nov. 15. He is expected to seek another five-term year in a vote by all provincial and national lawmakers by Oct. 15. Many experts say that retaining the army position into the next term would violate Pakistan's constitution. "If elected for the second term as president, Gen. Pervez Musharraf shall relinquish charge of the office of the chief of army staff soon after election, but before taking the oath of office of the president of Pakistan for the next term," government attorney Sharifuddin Pirzada said. Pirzada read the statement in the Supreme Court as it heard petitions that challenge Musharraf's holding of both offices and his eligibility for the presidential election. Pirzada added that Musharraf's nomination paper for the election would be scrutinized by the chief election commissioner "independently and in accordance with the law." On Monday, the Election Commission announced a rule change that apparently opened the way for the general to seek a new presidential term without resigning first as army chief - a move condemned by the opposition as illegal. Although critics will oppose Musharraf's retention of the uniform as he maneuvers to extend his rule, his decision to eventually step down as army chief is likely to be welcomed as a move toward greater democracy. For months Musharraf has been negotiating with exiled former Prime Minister Benazir Bhutto over a possible power-sharing deal, but negotiations have snagged amid opposition from right-wingers in the ruling party who could be eclipsed if Bhutto makes a triumphant return, which she plans to do on Oct. 18. Although Musharraf's move could be viewed as a compromise, the initial reaction from Bhutto's party was frosty. Raza Rabbani, a senior party leader, said it negated the spirit of the constitution. "We don't accept it," he said, adding that the current assemblies had no "moral mandate" to elect Musharraf as the president. Opposition parties are demanding that Musharraf seek election from a new batch of lawmakers after parliamentary elections due by January 2008 rather than from the current assemblies that were elected in flawed polls in 2002 and are about to be dissolved. The party of Nawaz Sharif, the prime minister ousted in Musharraf's 1999 coup and blocked last week from returning to Pakistan to campaign against the military leader, reiterated its total opposition to Musharraf. "He is blackmailing. This is a threat from him. He is saying that first you elect me as the president and then I will quit as the army chief. We reject this conditional offer and reaffirm our resolve that we will force him to quit as the president and the army chief," said Zafar Ali Shah, a senior party leader. 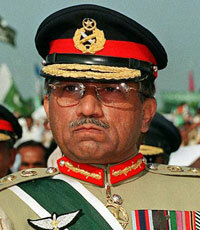 Mahdi Hassan, a Pakistani political analyst, said Musharraf was yielding _ reluctantly _ to growing domestic and international pressure to restore full civilian rule. "Musharraf's real power base is the army, and he does not want to quit as the army chief before getting another five-year term as the president," he said. "Sooner or later he has to do it."